For those properties that do not have a loft, the BBA approved Lo-Carbon PoziDry Compact provides an easy to install solution. The unit is duct mounted and can be fitted in a number of locations within a single floor flat or apartment. increased efficiency, lower sound levels and better performance. The fresh, filtered airflow passes along the ducting and terminates on an internal wall with a discreet grille. This directs the airflow upwards where the incoming air mixes with the warm air that gathers at ceiling height. The system provides fresh, tempered air into the home and creates an indoor environment where the damaging effects of condensation find it hard to exist, benefiting both the occupants and the structure of the building. The Lo-Carbon PoziDry Compact can be used for air replacement in conjunction with an extractor fan. A G4 filter is included as standard. The Lo-Carbon PoziDry Compact uses a sensor to monitor the ambient temperature, automatically adjusting the air volume when necessary and providing partial heat recovery. ‘Trickle’ speed is automatically selected when the ambient temperature is up to 18°C. ‘Normal’ is automatically selected when the ambient temperature is between 18 and 27°C. If the ambient temperature exceeds 27°C, the Lo-Carbon PoziDry Compact will automatically switch to standby (no airflow). The standby power consumption is 2W. 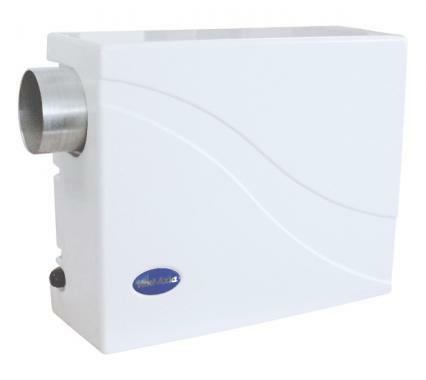 In the case of the integral 300W heater version, the heater element is automatically activated when necessary and tempers the supply air to 10°C. For air replacement through doors. Consists of a two-piece telescopic set, which fits unobtrusively on either side of the door panel. Minimum fixing thickness 30mm. Plastic. Dimensions: 454 x 90mm. See Ducting section. As standard. Measures the number of days the product has been switched on to provide precise running information. For those properties that do not have a loft, Lo-Carbon PoziDry Compact provides an easy to install solution. The unit is duct mounted and can be fitted in a number of locations within a single floor flat or apartment.